Tired of winter yet? I know we are. It has been a long and bitterly cold start to 2015 and as the temperature hovers around the -20C mark, I think we are all anxiously awaiting the blooms of spring! Never fear. While you wait for the barbeque to thaw out, here are some helpful and happy tips to bring some spring hope into your home. 1. Terrariums: these miniature ecosystem of plants are a fun and creative way to have a little spring all year round. Usually created in some kind of glass container, terrariums are all the rage! There must be a reason these little Zen gardens have taken the world by storm. Not only are they eye catching in style, but they are exceptionally low maintenance…who wouldn’t love them?! 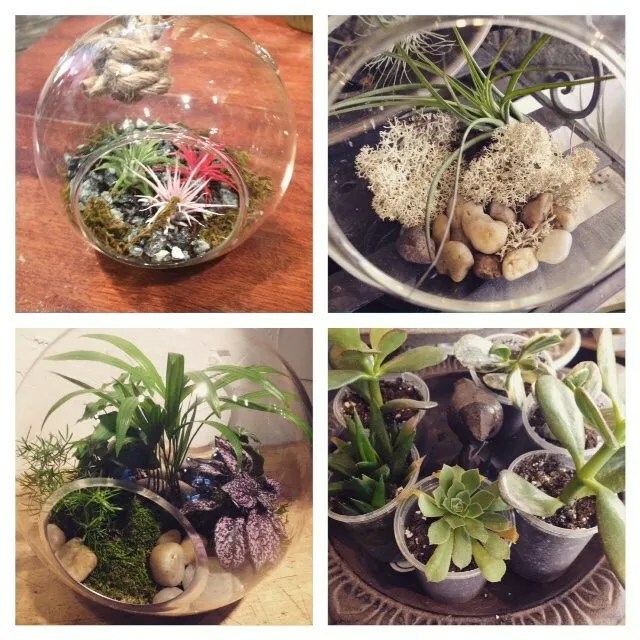 With a few rocks, some fresh moss and your choice of fairy plants, succulents, air plants or a combination of all three, you can have yourself a beautiful statement piece for your home. Whether you want it to be a small little something for your bathroom, or a giant coffee table conversation starter, there is something for everyone! Don’t know how to make one? 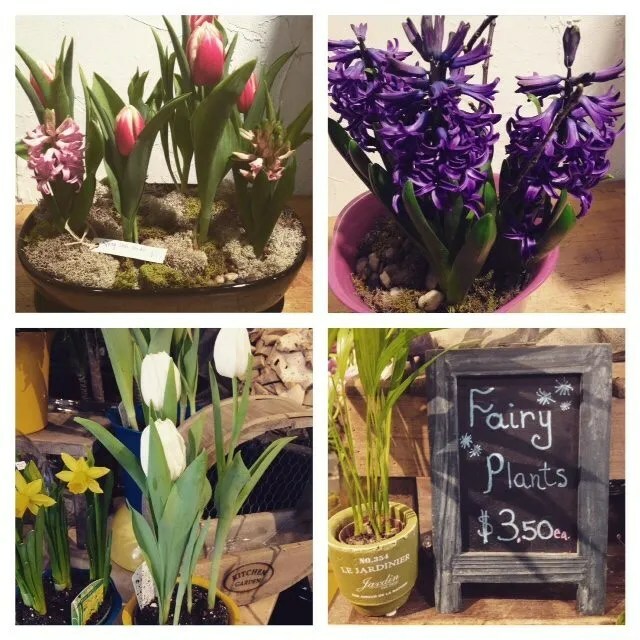 Come to one of Flowers Talk Tivoli’s Terrarium workshops and all your questions will be answered. You can even just bring us that amazing container you found and we will make one up for you. When it comes to Terrariums, you can’t go wrong. 2. Bulb Gardens: nothing says spring like watching spring bulbs begin to bloom. Creating yourself a bulb garden is another fantastic way to get a jump start on spring. We like to start with a beautiful jardinière and combine it with a nice mixture of crocus, tulips, and perhaps some hyacinth. Sometimes even the simplicity of one bulb variety can be a satisfying way to bring the garden inside. We have a wide variety to choose from, whether you would like to create your bulb garden or have one of our staff do it for you is entirely up to you! 3. Cacti: You may not know it, but the cactus along with its sometimes prickly appearance comes with some highly beneficial healing qualities. Having our houses shut up tight over the winter as we try to avoid massive heating bills results in quite unhealthy air pollution indoors. The cacti family and all its members can help to reduce these risk factors. They are little air purifiers. Having them situated in places like your bedroom, near the computer or in the bathroom can really make a difference to the air quality at home over the winter months. Not to mention increase the humidity, which, lets face it, we could all use a little more of at this time of year. The Christmas cactus is a good one to look out for! 4. Spring Wreaths: What a fun way to let people know that spring is on route! Either inside your home or boldly placed on your front door, using a spring wreath is an excellent way to make a statement. We love this option because the possibilities are endless. When we think spring wreath, we think spring flowers, burlap, mossy textures, birds’ nests, Easter eggs… the list goes on! They are timeless and you can use and re-use them. Again, this is a service we offer at Flowers Talk Tivoli and be sure that all our wreaths are made with great love and care. 5. Tulips: Last, but most certainly not least there is THE TULIP. Absolutely nothing says spring quite like a Tulip. For the people of Ottawa, spring truly begins once the world’s largest tulip festival commences right here in our own city. At Flowers Talk Tivoli, we boast a large selection of tulips that are grown successfully in the potato soils of PEI. They are a fresh and stunning option for a table centrepiece or as a hand tied bouquet to brighten someone’s day! Throughout the last of the winter months and right through the spring, Flowers Talk Tivoli will be hosting workshops for Building terrariums, bulb gardens, spring wreaths and more… Please stay tuned for our upcoming workshop schedule. Happy Spring everyone! Don’t forget that we are offering 20% off any in-store and in-stock purchase from now until the end of the month!